"This is a delicious simple sauce which goes with anything. You can have it plain over pasta or make lasagna with it. You can make ziti or spaghetti and meatballs (just cook the meatballs in the sauce - it will take longer) or anything you can think of. It makes good, slightly too bland, pizza sauce. You can triple the batch and freeze it in jars." In a medium bowl, blend the whole tomatoes and paste; reserve. In a large saucepan, warm olive oil over medium-low heat and add garlic; cook for a few minutes, but make sure to not brown the garlic. Pour tomato mixture in saucepan and stir; cook over medium heat for 10 minutes. Add parsley, salt and wine; reduce heat to low and simmer, stirring occasionally, until sauce thickens; serve. 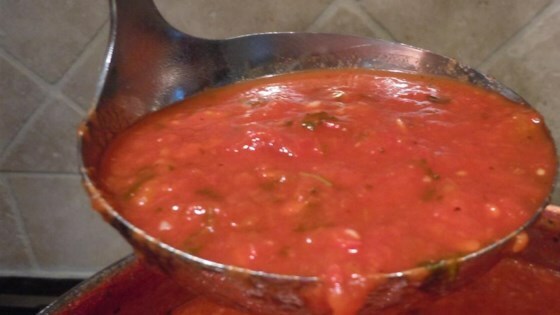 Make this great marinara sauce for your favorite pasta dish. My favorite is the Best Marinara Yet on this site. This one is good too, just a little plain and my fiance said too tangy. I was very disappointed in this sauce. A few more herbs would make the difference I think. I probably won't make it again. Quartering the tomatoes so that they melt into the sauce is an improvement, but this is an excellent sauce.